Q: How do you get pre-schoolers interested in the music of The Beatles? A: Just sit them down in front of Beat Bugs and watch it work its magic. This animated series, inspired by the music of The Beatles, is set in giant garden and is itself a bit of an inspiration. Woven into this ground-level world of big-eyed bugs and adventurous slugs are the timeless melodies of Lennon / McCartney, bursting with optimism and exuberance. Stocked up with the Northern Songs library of hit songs, Australian creator Josh Wakely has magically packaged them into 11 minute stories for pint-size kids. Sung by the likes of P!nk, Sia, The Shins, Of Monsters and Men, Chris Cornell, Regina Spektor, James Corden, and Daniel Johns (also credited as Music Producer), these Beatle tracks become musical moments in bigger tales directed at child viewers. Rather than being sung from beginning to end, the songs weave in and out with lyrics and hooks that suit the story. In the first episode, Jay is flung via spoon catapult into an empty jam jar -which gives rise to a rendition of the chorus from Help. His friends call upon Postman Bee to fly to his aid where working as a team helps him out of a jam (geddit?). Along the way there are ant-like antics, humour, singing and a sense of wonderment. In the second adventure a nervous Buzz can’t sleep due to her nightmares, so sleep doctor Dragonfly Lucy creates a sense of safety through her magical stories. These just happen to include a bridge by a fountain where rocking-horse people eat marshmallow pies. You guessed it, these are all animated, along with newspaper taxis appearing on the shore, and yes Lucy just happens to have those all-important kaleidoscope eyes. Did I mention her vocals are by P!nk? Beat Bugs has some serious cred for one so junior. In the third episode Walter the Walrus Slug remembers how making new friends didn’t go too well, especially when an egg-shell landed on his head. Cue: I am the eggman. I am the walrus, goo goo g’ joob…. You can see where this is going: Sgt. Pepper’s Lonely Hearts Club Band, Magical Mystery Tour -the possibilities are endless. Accompanying these clever tales are bright animations, with hints of cool-kid skateboards and street fashion. In its Honey, I Shrunk the Kids-like setting, there are ice-cream stick stages, acorn hats, deflated basketball homes, and crickets as goalposts -the insect kind. The visuals make for an alluring, inviting feast. The voice actors are largely North American, which takes away somewhat from the Australian origins of the project. This has funding from Seven, as one of several international investors, so it will also screen later on Presto (and outside Australia on Netflix). Seven is also screening 14 of these across 4 days, which is a bit of a shame as word of mouth will have less time to ripple. But this is a joyous achievement. 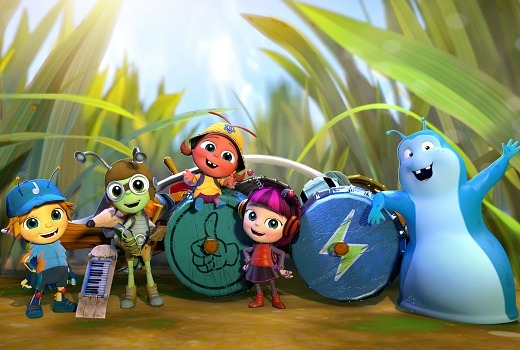 I reckon Beat Bugs will be one to record to your PVR to entertain the kids again and again. And just wait for the look on your kid’s face when they discover you already know the words to the songs of a brand new TV show! Beat Bugs premieres 4pm Monday July 25 (multiple episodes continue to Thursday July 28) on 7TWO.